I’m often asked for very specific recommendations, like “where do you find the best apple pie in Vancouver?” Or, who makes the best perogies in town? In an effort to discover true gems in each food category, I present To Die For Searches. Once a month, my trusty panel of contributors Erin Gerlach and Joann Pai and I, along with a guest judge or two, will choose an edible item, do our best to determine the leaders in that category (always making an effort to the include the hidden gems and small businesses) and then hold a blind, unbiased sampling. 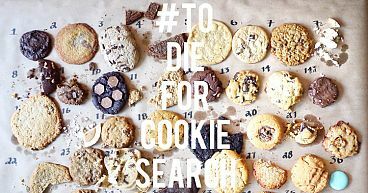 Before you get upset that your favourite cookie wasn’t included, please note that we’ve begun a list for To Die For Cookie Search Round Two that already includes Kitchening’s Ginger Chocolate Cookie, Thomas Haas’ Sparkle Cookie, Our Town’s Oatmeal Raisin, The Salty Cookie Co’s Salty Cookie, Hubbub’s Cookie, East Van Roasters’ Salted Chocolate Chip, and Pourhouse’s Cookie. Please send your recommendations to erin [at] itstodiefor dot ca or tweet: @erinireland. Please note: Tasting sessions are held blindly to remove biases (we fed each other with eyes closed!). As well, Subway cookies were included as a control. Chewy Oatmeal Raisin! Perfect Balance. Irresistibly Chewy. Stand-out! Nice plump raisins. Ridic! Buds are singing. Tiny hits of salt are pinging around my mouth. Amazeballs. Great layers of flavour. Lavender was intense and yummy. Flaky shortbread. Very modern flavour. Deeply caramelized buttery flavour with great extra — what’s that crunch?! Balanced with flavour and texture — keeps you guessing. So flavourful and spicy – intense! Mind blowing. Triple threat: texture, flavour, spice. Freaking amazing – huge pops of flavour everywhere. Rose water subtle and delicate – so good! Love the flavour, a little dry. Hearty! Lots of chocolate. Thick. Not too sweet. Wow! Fun to bite into. Extra moist, unique flavour. To Die For! Buttery, luscious, heaven. Crispy edge with doughy center – satisfying! So crunchy with rich and subtle flavour. Love the salt and texture! Not too sweet. Fabulous. A special thanks to judges Erin Gerlach and Joann Pai for sacrificing their waistlines in the name of cookie research. Next month, we’ll tackle Tuna Tataki. Who do YOU think makes the best in Vancouver? Ocean Wise recommendations only, please.